Charming apartment, 50 meters from the sea. completely renovated in closer compliance with ecology: isolation lime / hemp, walls coated with lime, tadelak ... this apartment carefully decorated is located in a quiet area (near the Solidor tower, photo 9 ) and popular Saint-Malo. It is located 50 meters from the sea, where is the handle of Solidor, 5 minutes from the marina and 25 minutes walk from the walled city. To go there, it is the occasion of a beautiful walk along the sea and the beach of Bas Sablons. Provide a deposit of 200 euros to be paid upon arrival. Sheets and towels and household linen will be provided with an additional 20 euros. Household expenses at the end of stays are optional (40 euros). This apartment is non smoking. Finally our friends the animals are not allowed. Thank you for your understanding. Beautiful full bathroom, equipped with a bath, sink, bidet and WC. The walls of this room are made of water tadelak blue sea and sand lime yellow. The end of stay cleaning is optional, this service will be charged 40 euros. 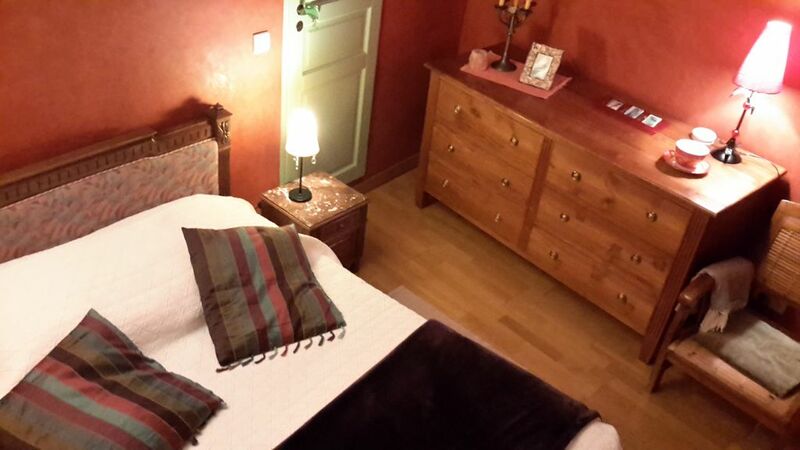 This is a lovely apartment in a great location in St Malo. It is not far from the main tourist center, Old Town, but far enough so that it is a very quiet and peaceful neighborhood. Old Town is an easy 25 minute walk, but not far from the apartment is another small set of shops so you only need to walk 10 minutes to find everything you need...markets, bakeries, banks, postal office, gifts and clothing, etc. The ocean is right outside your doorway, and there are many wonderful paths in the woods, walks along the coast and beaches to explore. The locals are also very kind and friendly! The apartment is perfect for one or two people. A very large bedroom, bathroom and a small kitchen. Its decorated very lovely, with some homey touches! Isabelle provides everything you need: kitchen supplies from plates, pans, cutlery, all types of mugs and glasses, twp different kinds of coffee makers (drip and italian espresso maker), an electric tea kettle...even spices to use for cooking! She provided extra towels and blankets, cleaning supplies, maps, and there is tv and wifi. Isabelle herself is very thoughtful! One rainy day she put an umbrella outside my door, and I didn't even ask. She offered to pick me up from the train station when I arrived and drove me back to the train station on the day of my departure. When we arrived, she provided a free bottle of traditional Brittany cider, AND a free drinking cup for me to keep as a souvenir. She even offered her bicycle to me! She was also very communicative, and responded to all my emails and questions within 12 hours when I was looking to stay at her apartment. I had such a fantastic stay here, and would definitely return, as Isabelle made it so wonderful and welcoming, and it is in such a beautiful location. Very nice place: clean, quite, comfortable, providing all the necessary. The appartment is renovated with a lot of taste and imagination. The owner is kindhearted and delicate. It was definitly a pleasure to stay there and it is a place that we recommend. Hübsche und bequeme Wohnung, optimale Lage, sehr nette und diskrete Vermieterin... Was will man mehr? Empfehlenswert! On a passé un super séjour à Saint Malo et l'appartement que nous avons loué à Saint Servan nous a beaucoup plu : beau, calme, très agréable, proche de la mer et des commerces. Aussi, Mme Ferrer, la propriétaire, est très sympathique et serviable. Nous reviendrons avec plaisir dans cet appartement si nous avons l'occasion de revenir dans le coin !! Nous avons passé de très bonnes vacances avec un super accueil de la propriétaire. Appartement idéalement situé pour ceux qui aiment marché. Nous avons quasiment pas utilisé la voiture durant notre séjour. Accès à St Malo en une vingtaine de minutes à pieds. L'appartement en lui-même est très bien équipé. Wir hatten eine sehr schöne Zeit in der gemütlichen und blitzsauberen Wohnung. Die Vermieterin ist sehr freundlich und hilfsbereit. Tolle Lage, nur 50 m zum nächsten Strand mit netten kleinen Cafès und Restaurants. on arrival at Saint-Malo Saint-Servan follow the indications; Solidor area; ste Croix nearby church. caution d'un montant de 200 euros demandée à l'arrivée, arrhes à la réservation, remise des clés par le propriétaire. A la demande, location de draps, linges de toilette et de maison : 20 euros. A la demande ménage après le départ : 40 euros.